Southeast Asia is one of the important production and consumption base for cassava, especially in Thailand. Phenacoccus manihoti Matile-Ferrero (Hemiptera: Pseudococcidae), one of the most serious pests of cassava worldwide, has recently reached to Asia, raising significant concern over its potential spread throughout the region. To address this, the ACISAI is implementing European Commission financed project “Emerging Pests and Diseases of Cassava in Southeast Asia: Seeking eco-efficient solutions to overcome a threat to livelihoods and industries”. 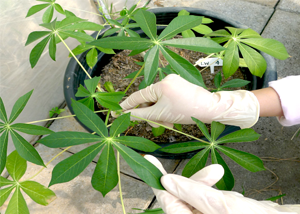 The research focuses on conducting laboratory assays to evaluate the effect of abiotic (drought stress) and biotic stress (mealybug infestation pressure) on volatile emission and spectral reflectance in Cassava plants.